Your screen, graphics card, and input device settings could not be detected >correctly. You will need to configure these yourself. Run in low graphics mode for just one session? I took the first answer and it showed me a little messagebox after it. Then after the screen turned black and never reacted again. I had to restart my PC manually. I tried it with a Live-USB-Stick too. But it was even worse because whenever I entered "Try Ubuntu" it leads me straigh to the Login-Screen too but it flashes everytime and I can't use the Login screen to type something in. I had to restart my PC manually too. Did I burned the DVD wrong and did I mess with the Live-USB up? Once you see this screen, press F6 and you'll see some boot options popping up. Navigate to nomodeset and hit Enter. 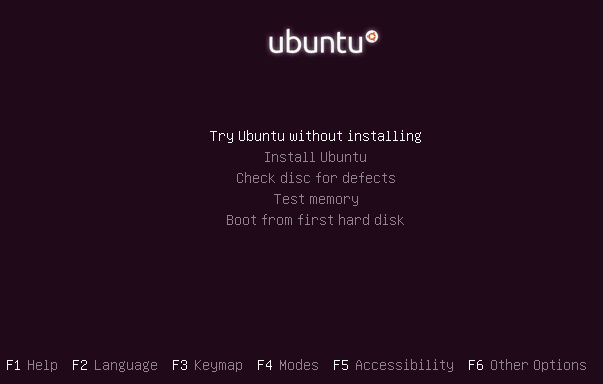 Press Esc and now choose Try Ubuntu Without Installing or Install Ubuntu, whichever you want. You should now see the desktop or installer.